There is no guarantee that the findings of the investigation will ever be made public, and in the meantime, Mueller has remained famously silent about what he’s found. But even the dribbles of information that have come out through court filings have slowly driven Democrats and Republicans further apart. 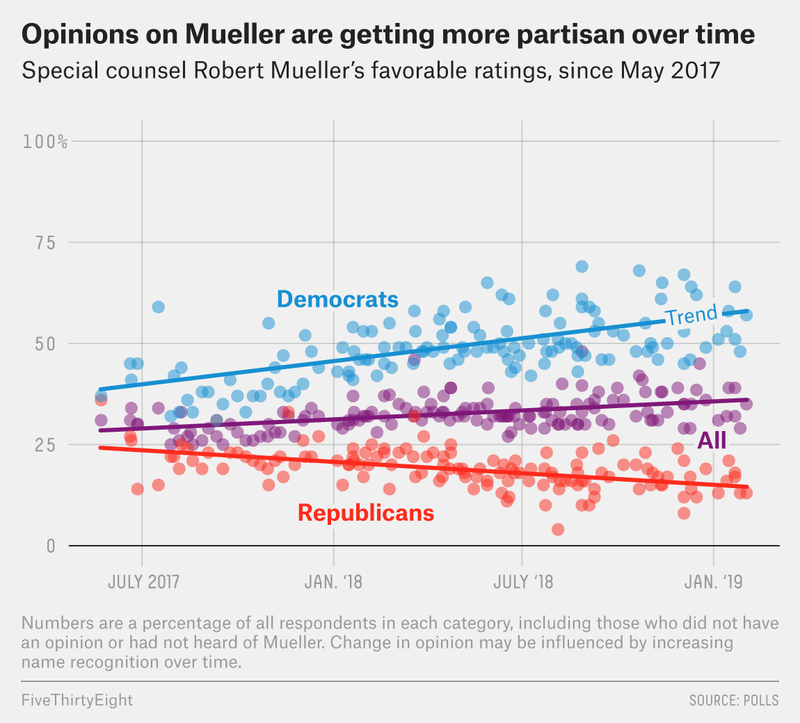 As you can see in the chart below, which tracks Mueller’s favorable rating over the past two years,1 there has been a small increase in the overall percentage of Americans who view Robert Mueller favorably (the purple line),2 but when you break it down by party, it’s clear that opinions about the special counsel have become more polarized. Americans can’t even agree on what the investigation has shown so far. According to a Washington Post-Schar School poll published on Tuesday, people are roughly split on whether the investigation has proven that Russia tried to interfere with the 2016 presidential election (it has charged a number of Russians with interference) and about whether people affiliated with President Trump’s 2016 campaign lied about contacts with Russians (several people who worked for the campaign have pleaded guilty to lying about Russian connections). Since Mueller himself has not been forthcoming, the media and commentators have filled the informational void with prognostications about what is happening and what the investigation might reveal, but this has often sowed confusion. The special counsel’s silence has also given Trump an opportunity to repeatedly claim that the investigation is a politically motivated “witch hunt,” a phrase he has used many times since the investigation first began. During his recent State of the Union address, Trump even warned Democrats against what he called “ridiculous partisan investigations,” which appeared to be a dig at both the Mueller probe and the House Democrats’ investigations of his personal finances. And it seems that Trump’s strategy is working. Over time, more and more Republicans have come to agree with Trump that the Mueller investigation is unfair.3 But the results of the investigation itself may still change people’s minds. 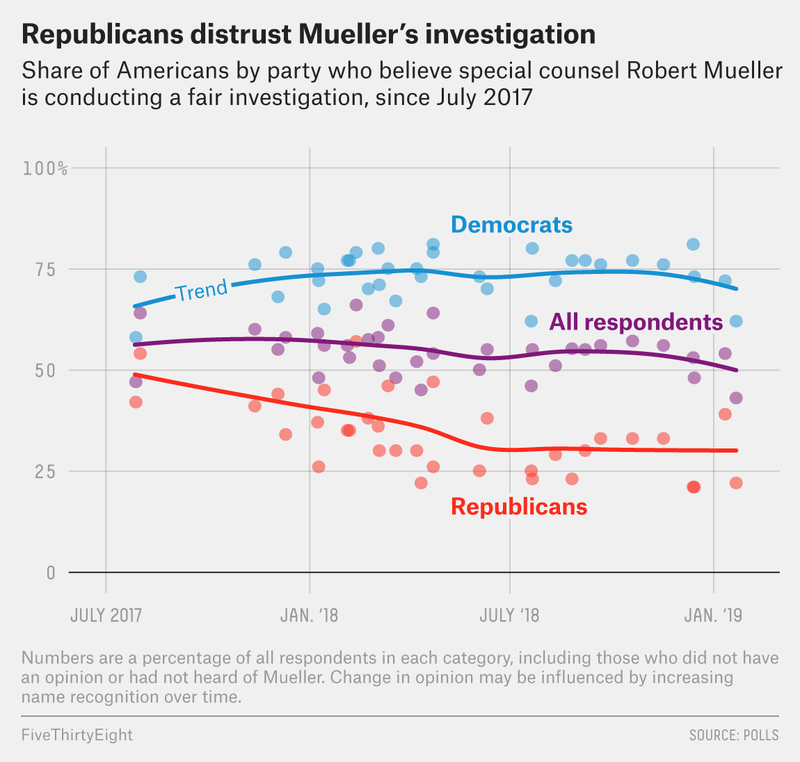 In late 2018, for example, amid a spate of indictments, the percentage of Republicans who thought the investigation was fair ticked up a bit. In July 2018, Mueller charged 12 Russian intelligence officers with hacking Democratic emails during the 2016 campaign. In September, Trump’s former campaign chairman Paul Manafort pleaded guilty to conspiracy as part of a deal to escape an array of other charges, including money laundering and acting as an unregistered foreign agent. And in November, Trump’s former personal lawyer, Michael Cohen, pleaded guilty to lying to Congress about his work on a Trump Tower project in Moscow after he had already pleaded guilty to bank fraud and campaign finance violations in August. If Mueller’s report finds that Trump directed his campaign staff to coordinate with the Russian government, 61 percent of Americans, including 29 percent of Republicans, said they would support Congress’s efforts to impeach the president, according to the Washington Post-Schar School poll. But the Senate Intelligence Committee has said it didn’t uncover direct evidence of a conspiracy between Trump and Russia during the 2016 election, so unless there’s a real bombshell in whatever report comes out of the special counsel’s office, the end of the investigation may not bring sweeping changes of opinion. Instead, we may just see the public dig in their heels and retreat to their partisan corners. We collected polls that asked respondents whether they have a favorable or unfavorable view of Mueller going back to May 17, 2017, when he was appointed as special counsel. This analysis includes all the polls we could find, though we may have missed some. Though that increase might be partly a result of increasing name recognition over time. The first poll we could find that asked about the fairness of the investigation and broke responses down by party was conducted in July 2017, roughly two months after Mueller was appointed to the probe.